I’ve vocalised this all over twitter and Facebook and a while back I blogged about wanting to start Alphabet Dating. I heard about it on Radio 1 about 5 months ago but we just never got around to starting it but we’ve done it now. With our A date and B date complete the wheels are in motion. For anyone that’s not familiar with the concept, you basically date your way through the alphabet. So A could be for Arcades. 3 – we take it in turns to plan the date! So that kind of blew out A for Arcades. We’ve done the 2p machines at Blackpool loads! So instead we started off with a bang on holiday in Greece. 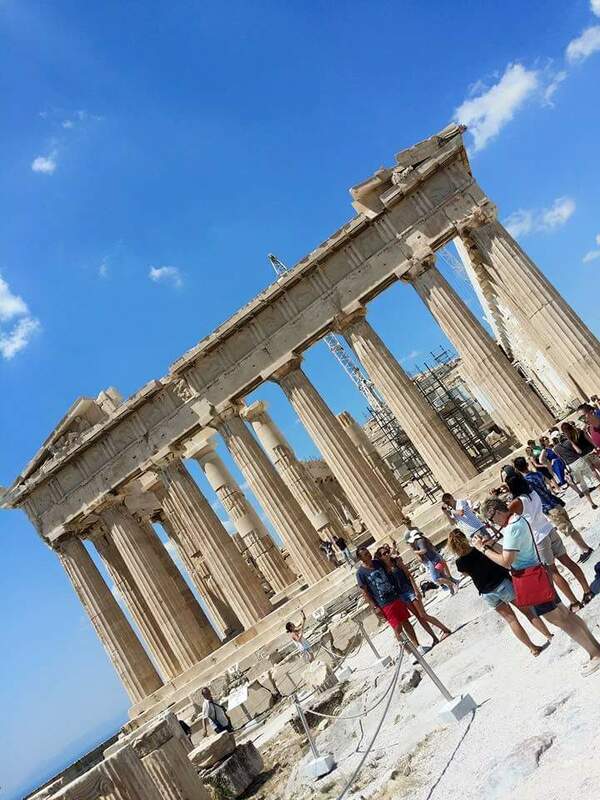 We went to the Acropolis of Athens! I love ancient cities and Dave is a quarter Greek so this was a fab option for us! 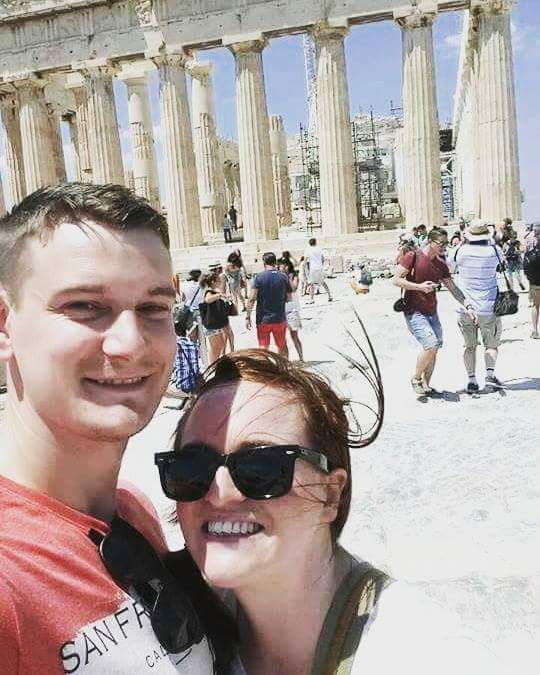 He’s been to the Acropolis but I never had but he really loves it there. On the 7th July, on a scorcher of a day (or at least for my very non – Greek ginger skin!) we caught the metro from Kat to Monastraki Square in Athens. The metro was free because it was that funny time when Greece nearly left the Euro Zone. People could only get 50 Euro out the bank a day and that came in a 50 Euro note. The 1.10 Euro metro fare would have been a nightmare! Anyway, as always I digress. When we got into Monastraki I assumed we’d see the Acropolis straight away. Well how wrong I was! No sign of it at all! It was probably only half a mile up to the main entrance to the Acropolis just up a road off the main square, and we made fast work of it considering the heat, steepness, and poorly maintained paths. After buying tickets it was one final walk up to the Acropolis. The scenery walking up was unbelievable! We could see so many ruins, the Parthenon, derelict amphitheatre and the Temple of Zeus and the original Olympic Stadium in the distance. 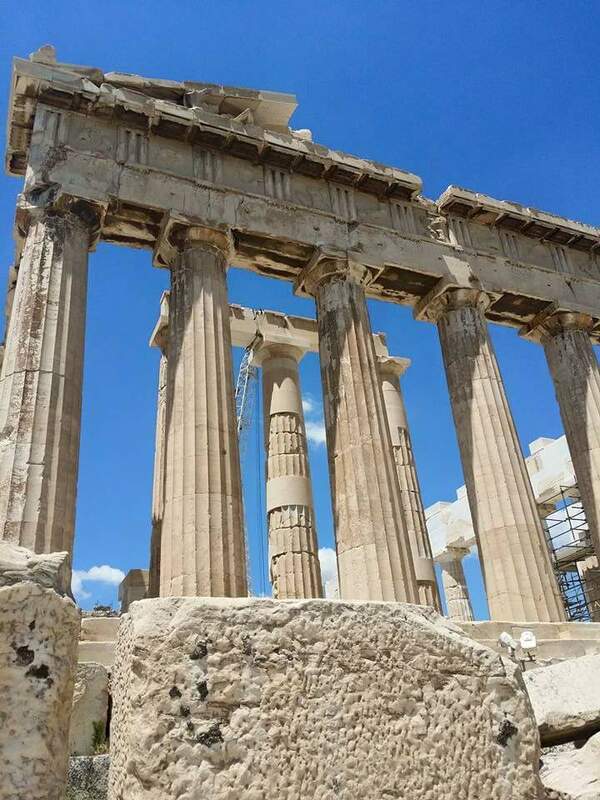 Once we reached the Acropolis, which you need to bear in mind is on my bucket list, all we were greeted with was crowds and crowds of people and a big old marble structure covered with scaffolding. * My initial reaction was to be quite disappointed but really, if a building has been there 2000 odd years and survived wars, even surrounded with scaffolding is pretty awesome! Walking around to the back side of the Acropolis, it regained some of its magic as the evidence of being held up with metal poles wasn’t as prominent as at the front. In all honesty, it was truly breathtaking. To see something that has lasted thousands of years and is so vast in size is remarkable. And to share it with someone that’s as important to me as Dave is even more unbelievable. *The scaffolding has been on the Acropolis for around 30 years. The Greeks are taking parts of it bit by bit and restoring it.